Jalen being awarded the scholarship by Rohan Levy’s mother, Ms. Nadine Sylvester. 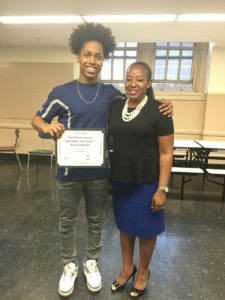 On Thursday, June 1st, Jalen Vasquez was awarded the 1st annual Rohan Levy Aspiring Architect Scholarship from Rohan’s mother, Nadine Sylvester. Ms. Sylvester created this scholarship in memory of her late son Rohan Levy, a student at WHSAD who was fatally shot and killed in February of 2017. Rohan was an exceptional student who was attending WHSAD with aspirations of becoming an architect before his life was tragically cut short. Ms. Sylvester set up this scholarship for young men of color who have been accepted into an accredited architecture undergraduate program, have met high academic standards and have served in architecture related extra-curricular activities during their time as students at WHSAD. For every year moving forward, this scholarship of $2000 will be awarded to a graduating student at WHSAD who meets these requirements.